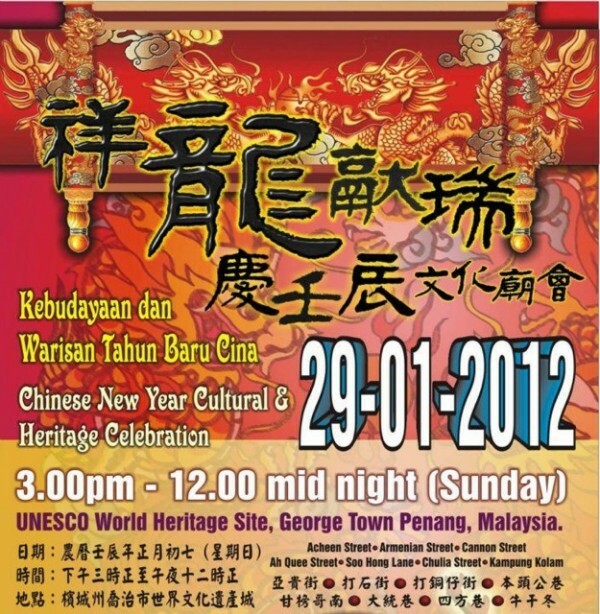 The Penang State Government and Penang Chinese Clan Council Penang is organizing a grand event to usher the Year of the Dragon. 1) 6 “ Chinese Traditional Livelihood Zone” , “Clan Area”, “Chinese Native Area” featuring Chinese virtue, traditional Chinese cuisine, Dragon calligraphy , photo exhibition, 12 Lunar seasonal festivals exhibition, other traditional Chinese cultural exhibition, performances and demonstrations. 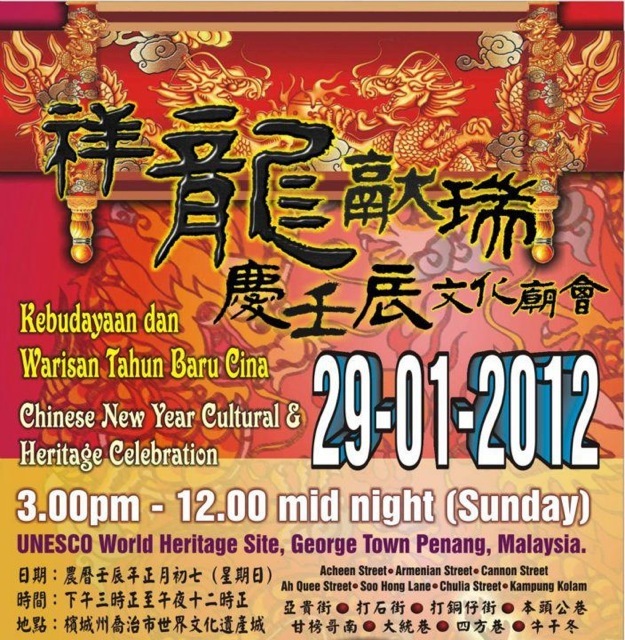 2) Down Memory Lane with traditional games, handicraft trails, traditional Chinese cultural dance, opera shows, lion dance, Wushu performance at Khoo Kongsi, Cheah Kongsi, Lim Kongsi, Yap Kongsi and Penang Youth Centre. 3) Local Penang delights and hotel food stalls decoration. The organizers would like to invite everyone to participate in this exciting event. For further information about the event, kindly contact the organisers Mr Cheah Chuan Wooi : 012-4741312 or Mr Cheng Wei Pint : 012-5273888.